On Veteran's Day 2016 Governor McAuliffe announced, the launch of Cyber Vets Virginia, an innovative new initiative to provide veterans with access to cyber security training opportunities and resources to help veterans enter the Virginia cyber security workforce. Cisco, Amazon Web Services (AWS), ISC2, and the Institute for Veterans and Military Families’ Onward to Opportunity (O2O) have joined together with the Commonwealth of Virginia to sponsor a free cyber training pilot program for Virginia veterans who want to live and work in the Commonwealth and work in the cyber field. Administered by the Virginia Department of Labor and Industry (VDOLI), Registered Apprenticeships combine on-the-job learning with classroom-related instruction, with the latter often delivered by a community college or career and technical education center. Registered Apprenticeships provide valuable, life long career benefits, including: certifications and licenses guaranteeing proficiency to employers, hands-on skill development in the field, and the opportunity to simultaneously learn and earn - with a graduated pay scale that recognizes increased skill attainment. To support Virginia’s veterans, the Virginia Community College System may award academic credit towards a certificate or degree for military experience and training. Each community college has its own procedures and processes to evaluate experience and training. In 2017, the Virginia Community College System will launch a veterans’ portal, which shows how college credit is awarded for military experience. 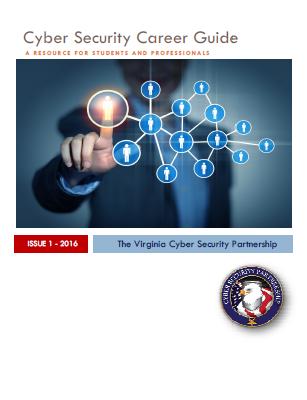 With over 800,000 veterans in Virginia, connecting military education and training in IT and cybersecurity to postsecondary education credentials is important to ensuring the Commonwealth’s cybersecurity workforce. The Commonwealth is home to many of the nation’s top-ranked universities and colleges. Over 107 cyber security programs are offered across the state at 20 public or private four-year institutions or 11 community colleges. Eight universities and three community colleges are nationally recognized as Centers of Excellence designation by the National Security Agency, Department of Homeland Security and Department of Defense. Financial support for education is available for veterans, family members of veterans, and active military personnel. These programs have different benefits packages and eligibility requirements, and should be carefully considered when calculating the cost of furthering your education. Onward to Opportunity (O2O) is a new FREE program offering industry-specific training, certifications, and job placement services on military installations across the country to participants. O2O partners with private sector companies committed to training and hiring veterans and military spouses. This guide will help navigate the cyber security profession by providing useful insights and resources for anyone interested in entering the field of cyber security. 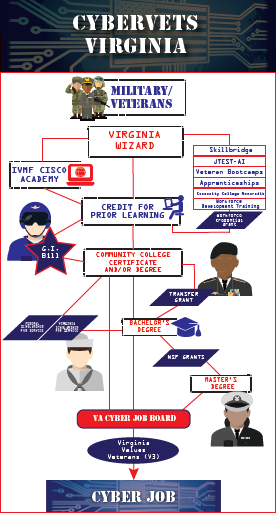 Virginia has created multiple pathways for a veteran to move straight into the workforce or enter one of the many world-class training or education programs. Please click on graphic below to learn more about jobs, business partnerships, financial support and education and training opportunities.